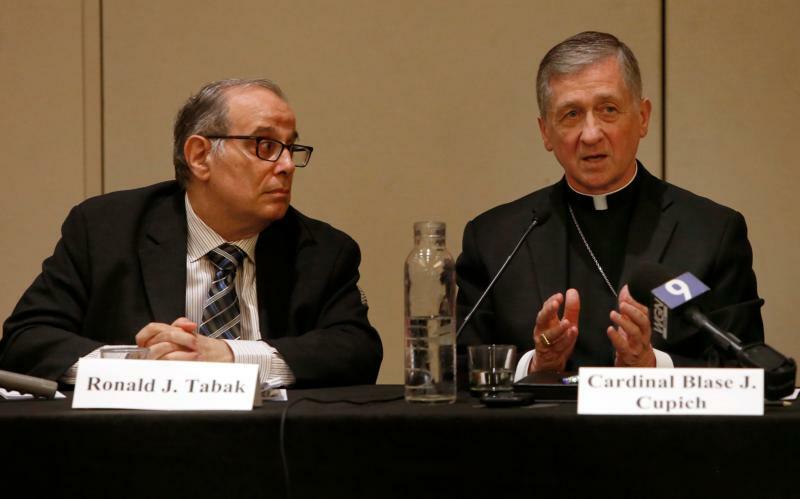 CHICAGO (CNS) — Chicago Cardinal Blase J. Cupich, speaking during an Aug. 2 panel discussion, described how Catholic teaching on the death penalty has developed and stressed that putting people to death — even criminals who are certainly guilty of terrible acts — makes it seem that the God-given right to life is conditional. The cardinal participated in an event titled “Has the Death Penalty Become an Anachronism? A Discussion of Changing Laws, Practices and Religion on Our Standard of Decency” and hosted by the American Bar Association’s Section of Civil Rights and Social Justice at Swissotel Chicago. He was joined on the panel by Robert Dunham, executive director of the Death Penalty Information Center; Meredith Martin Rountree, senior lecturer at Northwestern University’s Pritzker School of Law; and Karen Gottlieb, co-director of the Florida Center for Capital Representation at Florida International University. The panel was moderated by Ronald Tabak, chair of the death penalty committee of the ABA Section of Civil Rights and Social Justice. The other speakers discussed the development of capital punishment, circumstances where the death penalty can be applied constitutionally, if at all, and the many ways it has been applied unfairly and arbitrarily. Dunham said the biggest indicators about whether someone will be sentenced to death have little do with how horrific the crime was, or how morally culpable the person is judged to be. Instead, it has more to do with the county where the crime was committed, the political views of the prosecutor, whether the accused receives a competent and committed defense, and race — of the accused and the victim. Rountree pointed out that since the death penalty was reinstated in the United States in 1976, dozens of people have been executed under laws that were later found to be unconstitutional. Those executed include: those who were under 18 when they committed their crimes, those who were intellectually disabled and those who were sentenced under rules that did not allow mitigating factors to be introduced. Gottlieb spoke of the arbitrary way the death penalty is imposed. In Florida, she said, the system originally called for the jury to make a nonbinding recommendation to the judge about whether a defendant should be put to death. At least two people were executed after a judge overruled a unanimous recommendation from the jury that the defendant be sentenced to life in prison. Florida has declined to rehear the cases of 160 prisoners on death row sentenced under the old rules because they were sentenced before the U.S. Supreme Court ruled in an Arizona case that defendants have the right to have a capital sentence determined by a jury. Popular support for the death penalty, the number of death sentences imposed and the number of executions carried out have all decreased since the 1990s, Dunham said, but the racial disparity in death penalty cases has actually increased. At the same time, Catholics and others who consider themselves pro-life cannot argue that all human beings have dignity because they are created in the image and likeness of God but deny that dignity to criminals. He said Pope Francis’ revision of the catechism will not win universal support, even among Catholics. Martin is on the staff of the Chicago Catholic, newspaper of the Archdiocese of Chicago.